Hyundai Motors India pushes the engineering, dynamics and exterior appeal of cars to the edge with facelifted version of Verna sedan. Among several of its variants, Hyundai 4S Fluidic Verna 1.6 SX VTVT is a top end trim that has already stunned legions of car lovers both in India and abroad. The artistically built sedan reaches new heights with improved features both inside and out. Its admirable looks are sharpened with slight alterations to its front that leave its viewers breathless and thrilled. The front portion has a wing shaped grille of an all new design. Projector lamps along with all new fog lights have been given for improved style. The company paints the finest exterior design with its 'Fluidic' structure. This, along with the glossy metallic wrapping together form a spectacle for this sedan's viewers. The visual masterpiece that this vehicle scores is balanced by its interior features. The car maker has stuffed it with the best of comfort and convenience features, while the upgraded version goes a notch further. The flexible ergo lever is an addition to the interiors, a feature that allows the front seat to be pushed forward for greater space at the back. Aside from these slight variations in design, the sedan retains all of the grandeur and classiness that it had initially been crafted with. The 'Fluidic' design philosophy does not cease to amaze, as it does with this new launch. The Hyundai 4S Fluidic Verna 1.6 SX VTVT dazzles with an outer format that is sure to revolutionize the very way cars look. The new cosmetic updates brings an edge to the its overall look, while at the same time, preserving the stylistic brilliance founded by the original one. Propped up front is a sleek, wing shaped grille, with dual chrome slats. Two boomerang shaped fog lights sit by either side of the air dam. The front bumper is modified for a more fierce touch to the overall look. The side profile is refined with the addition of diamond cut allow wheels. Chrome door handles and a two tone chrome rear garnish completes its style quotient, raising it to its fullest. The new launch styles up many elements, but manages to stick to its promise of luxury and comfort. Here is an interior that brims with comfort and utility, going far out to soak its passengers in the finest atmosphere possible. The spacious, exalting aura that the cabin has to offer is enhanced with the most premium material and accents. It has an automatic air conditioning system with a climate control feature. Well positioned vents ensure the greatest circulation within the cabin. In addition to this, a clean air ionizer instills freshness and keeps it preserved throughout. An electrically adjustable rear view mirror bring good utility to the rear passengers, along with an electrically foldable outside mirror. The well designed dashboard has a screen propped up top with a cool blue illumination, and a radio screen below as well. The sedan is also complete on all conventional features, with front seat back pockets, a cooled glove box, a sunglass holder, and a passenger vanity mirror. Going a notch further to pamper its passengers, it also provides a theatre dimming interior lamp, a front map lamp and a smart key with the start button illuminated. Powered by a 1.6-litre VTVT petrol engine, this is a machine that delivers holds nothing back in terms of performance. The massive engine has a displacement capacity of 1591cc. The power plant pumps a maximum power of 121hp and a peak torque of 154Nm. Armed with this impressive machine, the car jumps to a top speed of around 195 Kmph, and can accelerate towards 100 Kmph in a stunning 11 seconds. Beside its high grade performance, this engine is also built for efficiency, as it delivers an extraordinary mileage of 17.43kmpl. This intense capacity is is translated with the help of an efficient 5 speed transmission. All in all, this machine is built to awe both its passengers, and pedestrians by the street. The Hyundai 4S Fluidic Verna 1.6 SX VTVT builds an all rounded success. It balances intense performance with smooth handling. The front axle of this sedan is geared with McPherson struts including coil springs, while a couple torsion beam axle system given at the rear. Besides the suspension, this car's braking system is also advanced on all levels. It has excellent discs. They bring the vehicle nothing short of an effortless cornering, and bring the car to a stop in a tight distance. Armed at the rear are disc brakes, meant to refine the braking capacity even further, enabling the best cornering a driver could ask for. In addition to these conventional features, the sedan takes on safety through the technological frontier. Anti lock braking system with electronic brake force distribution aids the driver with friendly and reliable handling. 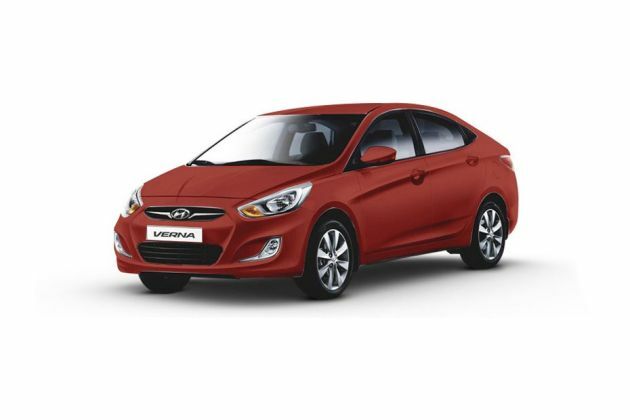 Hyundai has always built cars to reach out to its passengers with a homely atmosphere. And this model fulfills this promise on many fields. The cabin is loaded with features for comfort and convenience, cloaking it in the most human feel a car can give. The high end 2-DIN audio system delivers the finest of musical experiences to ease the driver. An inbuilt Bluetooth connectivity raises the cabin's spirits, also providing a phone calling and receiving facility. Standard comfort elements include a sunglass holder, a cooled glove box, a front vanity lamp, a front map lamp, electrically adjustable rear view mirrors, and a theater dimming interior lamp. The prominence of Hyundai's inner detailing is complete with an advanced driver information system. All this and more come together to form this the most energetic of cabins to be in. This high class sedan engraves its automotive success not without the firmest of safety to accompany performance and style. The manufacturers leave no stone unturned in making this sedan the safest car to be in. It is complete with strong seatbelts to strap the passengers in, airbags on all side, powerful front fog lamps, and rear parking sensors. In addition to these conventional features, the Verna seals its passenger's safety with technological aids. A rear view camera provides extra aid for the driver. Impact sensing auto door unlock comes as a bolstered safety feature. A speed sensing door lock balances the sedan's sporty nudge. An electric power steering with tilt function helps the driver with a smoother handling, and also secures reins on safety. Anti lock braking system with electric brake force distribution enhances the safety levels by many lengths. An engine immobilizer plants all round safety and security. 1. Stylistically designed interiors and exteriors. 2. Excellent range of safety and comfort features within. 1. Its performance can be enhanced. 3. The price range could be more affordable.